Approximately 3,200 residents live in Woodstock. About 900 residents live within the Village of Woodstock, with the remaining living in or near the small hamlets of Taftsville, West Woodstock, Prosper and South Woodstock. Taftsville is a quiet residential hamlet of less than one hundred people. Named after the Daniel Taft family who built the Taftsville General Store and ran a large iron manufacturing facility on the river in the late 1800’s. This factory produced scythe blades, stoves and iron implements. The General Store is to this day, the centerpiece of the Taftsville Historic District and houses the Taftsville Post Office. 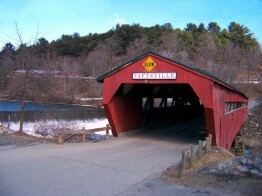 It overlooks the Taftsville Covered Bridge (the second longest covered bridge in the State of Vermont), a turn of the century brick powerhouse and rushing waterfalls leading to the beautiful River Road. The Taftsville Mennonite Chapel was founded in 1940 by Mennonite parishioners from Pennsylvania. At one time in the late 1800’s Taftsville had a railway station. There were also mills and a brick yard along the Happy Valley Brook. The valley straddling Happy Valley Brook also was a successful farming community. West Woodstock is a mixture of residential homes, community facilities and some commercial entities. West Woodstock, which at one point had its own store and post office, was anchored by Daniels Machine Company, a large manufacturing facility which sat on the site of the current Woodstock Farmer’s Market. There was a dam on the river and a mill pond to generate water power for the factory. Remnants of the canal can still be seen south of the iron bridge. The Town Highway Garage and West Woodstock Fire Station is located in this hamlet as is The Woodstock Union High School and Middle School. In 2003, the Union Arena Community Center (www.unionarena.org) opened with a 30,000 square foot ice hockey rink, locker rooms and viewing stands. The facility is open year round as a venue for sports, cultural and community gatherings. Vermont’s oldest weekly newspaper, The Vermont Standard is located along Route 4 in West Woodstock as is the Thompson Senior Center and the Woodstock Jewish Community Center. Bookbinding, another early industry in West Woodstock, still exists today at the Lewis Bible Bindery which is famous for it’s high quality leather-lined bibles. It is located on U.S. Route 4. Prosper, formerly named English’s Mills, was so named because of the prosperous nature of that community. The mill was located at the junction of Austin Road and Route 12 on Prosper Brook, sometimes called Barnard Brook. Mr. English employed a large mill crew. At one time the hamlet educated its children at the Prosper School. Prosper Community House is the central community meeting place where residents and friends gather periodically throughout the year for community dinners, etc. Currently, Prosper is strictly residential. South Woodstock, once called South Parish is a prospering, self-sufficient hamlet. In the past, it had its own academy, stores, tavern, hotels and manufacturing mills along the Kedron Brook. It was on the Springfield to Woodstock Turnpike (currently U.S. Route 106). Farming on Fletcher Hill and Long Hill was very successful, especially during the sheep farming era. Driving through the hamlet one is struck by the beauty of the quaint old homes, gorgeouse green fields and autumn colors that light the hills in the peaceful Kedron Valley. South Woodstock also has a Design Review District. 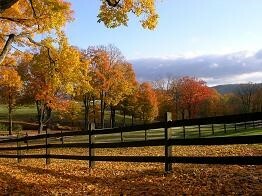 It is home to the South Woodstock Country Store, Kedron Valley Inn, Kedron Valley Riding Stables and the Green Mountain Horse Association (the nation’s oldest continuously operating horse association). 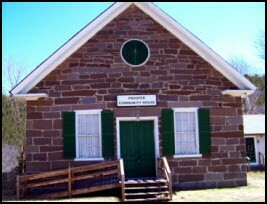 At one time, children were taught at The Country School (private secondary school from 1944-1980) and the Green Mountain Perkins Academy (built in 1848 and currently the Green Mountain Perkins Academy & Historical Association). 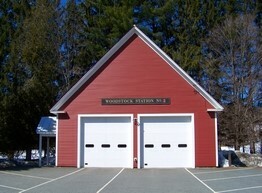 The hamlet is protected by the South Woodstock Fire Department, an all volunteer fire and rescue department.